Yesterday a buddy of mine requested a project. He's a college football (pro football, any football, any sports, really) nut, and so he's involved in setting up a bowl game pool. 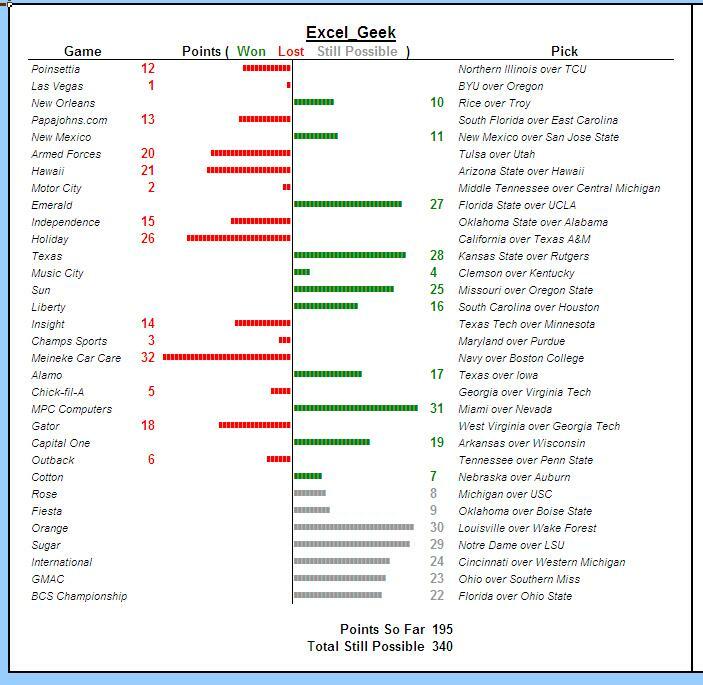 What he wanted was a simple spreadsheet to keep track of everyone's picks, as well as how many points they allocated to those picks. Then as the games are played and winners are known, the sheet could be updated to see how the points standings are going. He said he looked all over the internet, and there are tons of them out there, but everyone wants too much for them. Being in the Christmas spirit, I decided to bang one out for him at a $50 discount. That's right...free. The sheet is fairly straightforward. I've used sheet protection and data validation to ensure users don't "break" the sheet, and I'm using a bunch of conditional formatting to show which games are over, which picks were good ones, etc. I also included a chart summarizing the current standings at any given point. Merry Christmas, Jason, and merry Christmas to all of you Insiders subscribers who are getting this one, too!